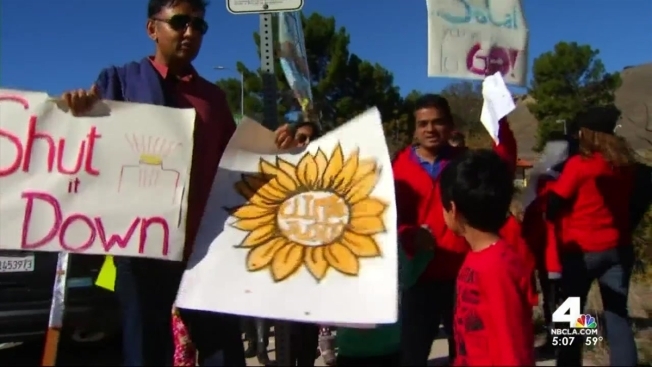 Frustrated residents gathered at the site of a gas leak in Porter Ranch Saturday to rally for the issue to be taken care as the gas leak enters its seventh week. "What do we want? Shut it down! When do we want it? Now!" residents shouted at the intersection of Tampa Avenue and Sesnon Boulevard - "ground zero" for the leak. On day 51, residents wore masks at a rally as they demanded that SoCal Gas shut down the site. Protesters said that they suffered severe health issues - including irritated throats, out-of-control coughs, and watering eyes. A resident brought a family pet and said the dog's eyes were red and irritated due to the leak. "Her eyes have gotten pinker," Christine Galanti said of her chocolate Labrador. She said the dog's has become lethargic since the gas leak starter. Galanti and her husband Craig live two blocks from the leak site, and they have joined more than a thousand Porter Ranch residents waiting to temporarily move out. The estimated time it will take SoCal Gas to stop the leak was three to four months. The leak was discovered seven weeks ago by gas crews at a well in the Aliso Canyon storage facility. Another resident, Jay Corson, was among more than a thousand residents who have since relocated. "I have not been in my house for three weeks," Corson said. Others said the odor stretched beyond Porter Ranch. "We have friends in Northridge, friends in Granada Hills - everybody smells it," Andrew Krowne, a Chatsworth resident, said. SoCal Gas maintained that natural gas is not toxic and leaking levels are too low for any long term health concerns.